You can stretch this for a starter for six people by crumbling the cod between each plate. Heat a large saucepan until it's very hot, then add the mussels, carrot, shallot and white wine. Cover with a lid and cook for 4 to 5 minutes, until the shells have all opened. Discard any unopened shells. Remove the mussels from the shells and keep the cooking liquor. To make the risotto, melt 75g of the butter in a large pan over a medium heat. Add the garlic, shallot and thyme and cook for 30 seconds, until fragrant, then add the rice. Cook the rice for 30 seconds, stirring until its coated with the butter, then pour in the wine and cook for 1 minute more. Add the stock one ladle at a time, stirring until it's fully absorbed before adding the next ladleful, followed by the reserved cooking liquor from the mussels, stirring every couple of minutes and allowing the rice to absorb each addition of liquid. Repeat until the stock has all been absorbed and the rice is al dente, then allow to rest for 5 minutes. 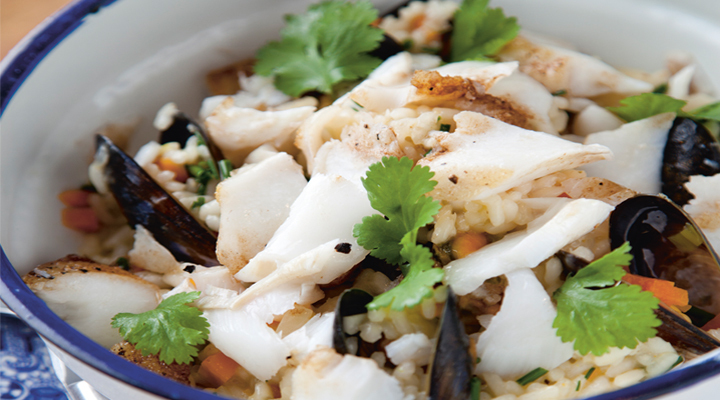 Add the mussels to the risotto and stir in the remaining 25g of butter until the risotto is rich and creamy. Check the seasoning, then stir in some of the lemon juice, the parmesan and most of the chives. Heat a little oil in a pan over a medium heat. Fry the cod, presentation side down, for 4 minutes, until golden brown. Turn the fillets over, then add the butter to the pan and cook for another minute. Season the fillets with salt and pepper and finish with a little lemon juice. To serve, divide the risotto between four plates and place the cod fillets on top. Garnish with the remaining chives and some parsley.